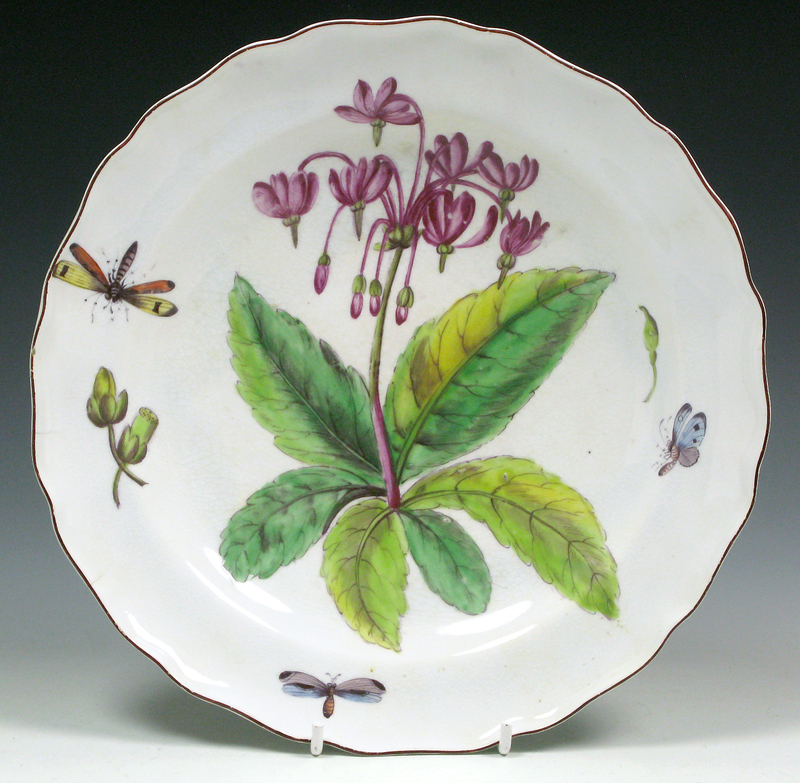 A Chelsea plate with a wavy brown-edged rim, painted with a Corallodendron flower, leaves, floret, seed pod and seeds, and two butterflies. This exhibition celebrates the physician and collector Sir Hans Sloane who was a great patron of the Chelsea Physic Garden. 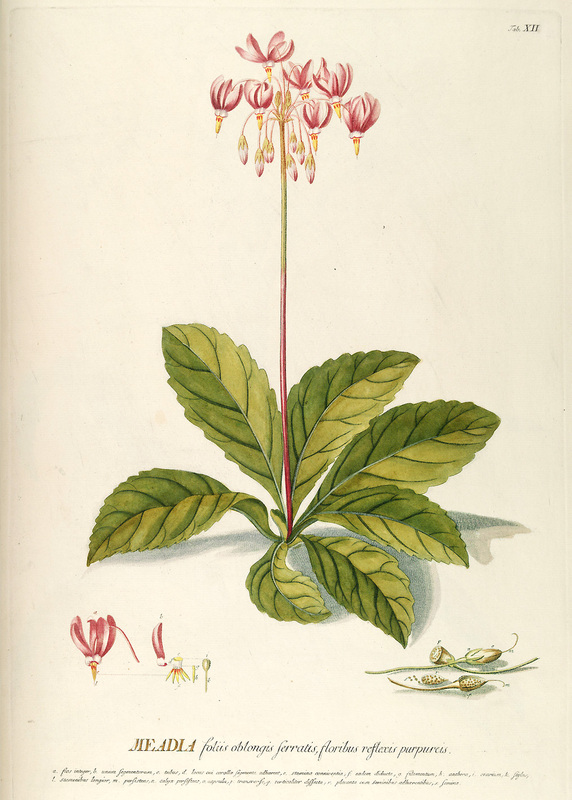 The garden was a great centre of botanical research at a time when ships returning to London from Asia, Africa and the New World were bringing many unknown plants back with them. Sloane, himself, collected plants and animals and studied botany. The chief gardener at the Chelsea Physic Garden from 1722 was Philip Miller who in 1731 published the Gardener’s Dictionary and later Figures of Plants, which showed the new plants in illustrations by Georg Dionysius Ehret. 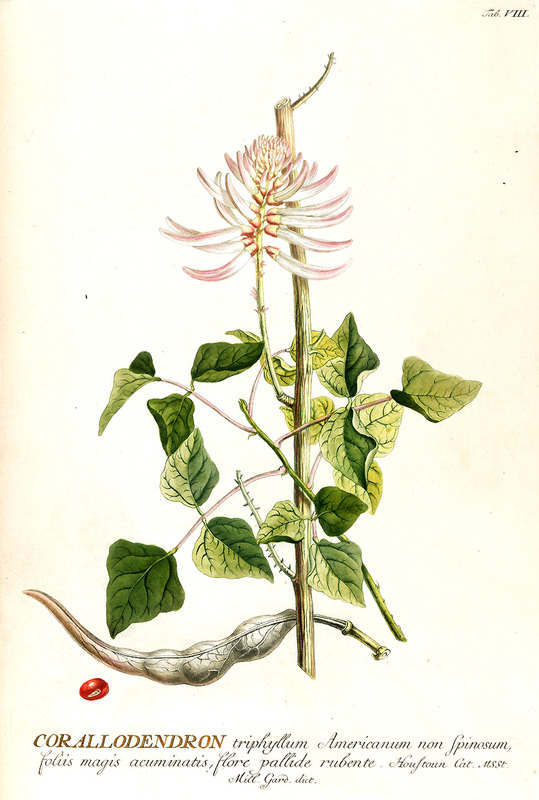 Ehret was the botanical artist of the time and had also provided illustrations for other books, including Plantae Selectae by Trew and Phytanthoza Iconographia by Weinmann. 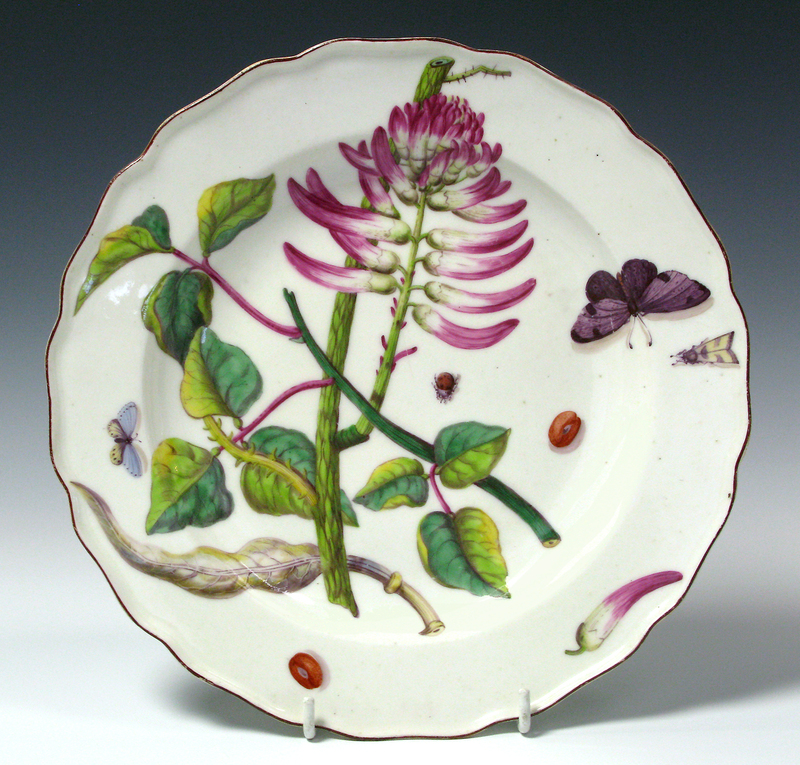 A plate with a wavy brown-edged rim, painted with a Dodecatheon Meadia, two seed heads, an immature seed head and three flying insects. These and other published works were the source for the wonderful botanical decoration found on Chelsea porcelain in the 1750s and which are known as Sir Hans Sloane plants. This special exhibition, thanks to the loans from museums and private collections, brings together over seventy pieces of Chelsea porcelain which are shown alongside images of their source engravings. The exhibition is accompanied by a highly detailed hardback catalogue (£30 + postage) by Sally Kevill-Davies and is the fruit of her research into identifying the plants found on Chelsea porcelain. Thanks are due to the Cadogan Estate for their sponsorship of it. Weekdays: 10 -5.30pm, Saturdays: 10 – 4pm. Sundays: Closed. This entry was posted in Books, Ceramics, Chelsea Porcelain, Decorative Arts, Fine Art, Illustrations, London W8, Porcelain, Visual Arts, Works of Art, Works on Paper and tagged ceramics, Chelsea, Chelsea Physic Garden, Chelsea porcelain, Decorative Arts, Ehret, Fine art, Philip Miller, Sally Kevill-Davies, Sir Hans Sloane, Stockspring Antiques, Visual Arts.